In addition to working with many others, John Rogers took the photos for several recent albums that I play piano on: Costumes Are Mandatory, Tootie's Tempo, All Our Reasons, and the forthcoming Billy Hart One is the Other. After the publishing of the article for NPR and even before, Ethan and I had already been talking about sharing this story for DTM. I recently read the following quote from Yusef on his funeral guest book. "I will watch you leave until you're gone – for I will never turn my back on those I love." This was in reference to the fact that Yusef would always watch his friends depart his company.Yusef did it for us that first day, but I did not know until a few days ago that he would always do this for Ed and apparently lots of other people as well. For me that's a beautiful thing I will try to incorporate into my life. As my friends all well know I am what tattoo people call a tattoo collector. On my chest I have some initials on each side: PM for Paul Motian and above that the words " Remember the good times". On the other side MB for Marion Brown and above that a hummingbird and the words "Stan the glad man" for my buddy Stan Rawls who took his own life. 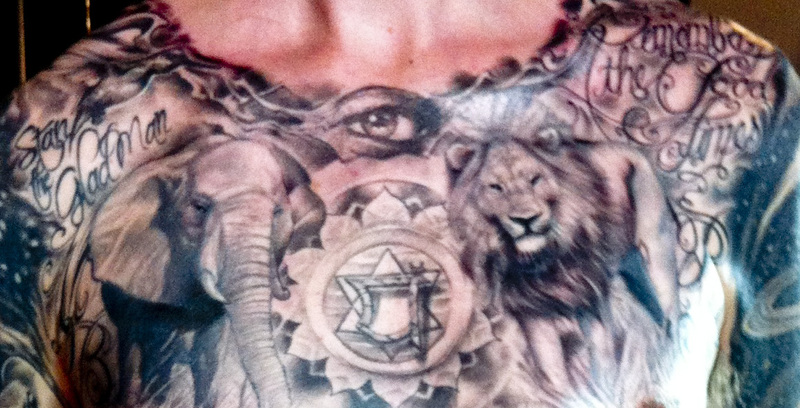 In the center is my heart chakra surrounded by a lion and a elephant for Ed and his teaching me about reggae music and culture from a young age. Above that is Yusef's eye to watch over me all the days of my life in this world. To protect me and be with me because real friendship never dies, and with my brother near my heart, I will never be alone.